Appended December 23rd, 2009, with more insights on Droid apps and sync-ability with the Mac. Appended December 27th, 2009, with 3G upload speed insights. Appended January 4th, 2009, with signal strength data. On January 5th, 2010, added Google Nexus One to feature comparison table. Is Verizon's Droid an iPhone "killer"? Or does it at least cure iPhone envy for Verizon Wireless users? I spent the last month using a Droid along side the Apple iPhone 3GS. I chose the Droid Eris by HTC since it appeared closer to the iPhone 3GS in form and function than the Droid by Motorola (with slide-out physical keyboard). I have some impressions to share. I was pleasantly surprised with the selection of apps for the Droid. I was able to find apps identical to the iPhone apps such as Bump, Pandora, Shazam, SportsTap, The Weather Channel, Unit Converter, Yelp, and YouTube. Some apps were similar to many useful iPhone apps such as Altitude, Barcode Scanner, Battery Graph, Calculator, Calendar, Compass, deciBel, Dictionary, GoogleMaps, HotelsByMe, Mail, Movies, Speedometer, and Thesaurus. Needless to say, the Droid only has a fraction of the choices available compared to those on the iTunes App Store, but it they have enough to make it a very useful smart phone. AT&T advertises that they have the "fastest 3G network." I did not find that to be true in all locations in our city. In one location Northeast of downtown, the Verizon Droid averaged 1689Kbit/s while the AT&T iPhone 3GS averaged 811Kbit/s. Move to the Southeast section and the results were much different: Droid = 429Kbit/s, iPhone 3GS = 1557Kbit/s. Both Verizon and AT&T have a strong 3G network signal in our city. In fact, we have a strong 4G coverage, but that's another story. When inside certain buildings, the AT&T iPhone's 3G signal was weak or non existent. Verizon Droid was not phased by being indoors. I hope when the 4G networks become the norm that Apple will have terminated their exclusive agreement with AT&T. If they offer 4G phones for all carriers, I predict their sales will double or triple. There are many similarities in the touch screen functions. The Droid supports the pinch zoom, drag scroll, app tile customization, predictive text, etc. There also many differences. One obvious difference is the number of keys. In addition to the "Home" and "Lock/Power" keys, the Droid Eris has "Menu," "Back," "Search," "Add," "See All Apps," and "Phone" keys. When you touch a key, it vibrates indicating that your touch was effective. There is also a trackball for navigating which doubles as a button for taking photos with the 5MP camera. Though the batteries have similar MhA ratings, the iPhone's battery lasted longer in my test. The Droid's battery level dropped from 100% to 28% during a 24 hour period though it was not used for anything but to check the battery level using the "Battery Graph" app. During the same period, the iPhone was used to make phone calls and do Google searches. Its battery went from 100% to 71%. One explanation for the iPhone's better performance might be the fact that the Droid had 11 apps loaded even though I wasn't using any of them. When I repeated the test with only Clock, Mail, and Battery Graph running, I had the same results. Why? Because those same eleven apps were running when I checked it the next morning. Apparently, apps like SportsTap are self starting even when it is sleeping. Multi-tasking has its advantages but, as you can see, it has its penalties in terms of battery life. GAME QUALITY: I finally found a FREE game on the Droid that was identical to one on the iPhone: Raging Thunder. The graphics and animation were virtually identical. It convinced me that the Droid has the potential to host games with the same quality as those on the iPhone. It would be interesting to see Tiger Woods PGA Tour running on the Droid. SYNC/BACKUP: Droid's PDF manual explains how to get the microSD card to mount as a virtual USB drive using the Droid's Notification Panel drop down menu after connecting to the Mac using a USB cable. Once mounted, iPhoto automatically launched, allowing me to import photos taken and stored on the Droid. I was also able to move AAC music files from the iTunes Music Folder to the Droid's microSD card using Finder Copy. After disconnecting, the Music app on the Droid searched the microSD for music. It found the tunes and allowed me to play them. However, there's currently no automatic sync of the apps, tunes, photos, contacts, and calendar for the Droid with your Mac. Nor is there automatic backup the same items to your Mac. Apps do exist that do piecemeal syncing such as the one that downloads information about your Facebook Friends. Though HTC does not provide a sync or backup app for Mac OS X, it's possible that a developer could create such an app. Meanwhile, for those who bought the Droid, I recommend MyBackup Pro app which can back up everything (incuding apps) to the microSD card or everything (not including apps) to an online server. UPLOAD SPEED: I wasn't paying too much attention to upload speed but here's an interesting factoid: the iPhone 3GS will not upload any faster than 384Kbit/s. (The best we saw was 295Kbit/s). The Droid Eris clocked as high as 835Kbit/s upload speeds during our 3G testing on Verizon's network. Advantage Droid. My 3G testing was not as comprehensive as what Gizmodo did. In their 12 city testing, AT&T won. WiFi upload speeds deltas were reversed. On our test lab's WiFi network, the iPhone 3GS measured as high as 7668Kbit/s. The Droid Eris never measured higher than 943Kbit/s. Advantage iPhone. SIGNAL STRENGTH: Using some utilities, I was able to measure signal strength in various locations. Minus 51 is very strong. Minus 119 is very weak. As you can see from my numbers, the iPhone's signal was stronger in 4 out of 5 situations. If you go by the numbers, the AT&T iPhone has the advantage, which flies in the face of my subjective experience. One explanation is that, though you have a good signal, a busy network can cause calls to drop or fail. 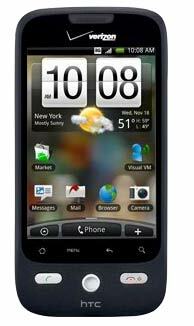 I'm not ready to trade my AT&T iPhone 3GS for Verizon's HTC Droid Eris. It is not an 'iPhone killer," but it does have enough "iPhone-ness" to keep many Verizon Wireless customers from "jumping ship." There are more iPhone competitors firing salvos across Apple's bow. There's a comparison of the HTC Droid HD2 with the iPhone 3GS on TechKnots. Since we posted this article, the Google Nexus One was released (see our review). Apple can maintain leadership by introducing an iPhone with 4G support, 10MP camera with LED flash, WiFi "n" (802.11n), 4" screen with 960x640 rez, and Java support -- and offer it to both CDMA and GSM service providers.